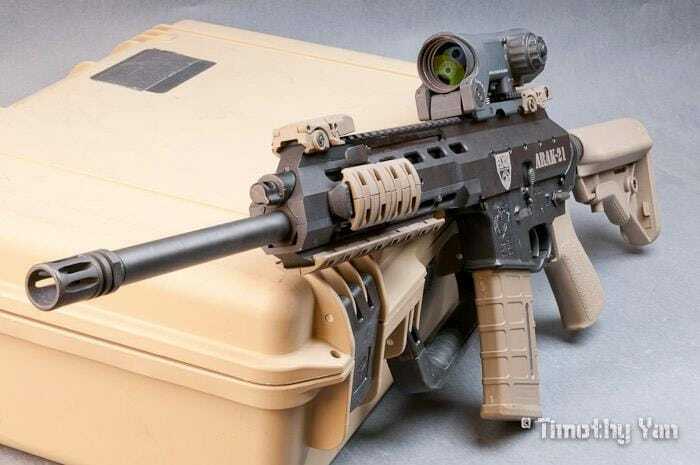 Faxon Firearms is planing to finish the final testing of their ARAK AR-15 upper receiver later this month, and if it gets the all clear, it will go into production shortly, hopefully at the top of 2013. In a recent update on their Facebook page, they laid out some dates and other information. The ARAK is part AR and part AK. The AR part is that it’s made to work with AR-15 lowers, but the upper is built around a long-stroke gas piston system like those used in Kalashnikov rifles. It also draws from the FAL deck with the type of adjustable gas regulator it uses. Another AK-like feature is that the bolt carrier runs on hardened steel rails inserted into the upper receiver. Part of what makes the AK so damn reliable is the minimal contact area to bolt carrier mass ratio; using rails for the bolt carrier group means that even if the receiver is contaminated, rusted and filthy, the bolt can just break through any build-up or crud that might cause a differently-operated rifle to fail. The adjustable gas port is icing on the cake, because it allows you to overgas the system if it’s extra-filthy. Between the long-stroke gas piston and the steel rails the bolt group rides along, carrier tilt is not possible with the ARAK. 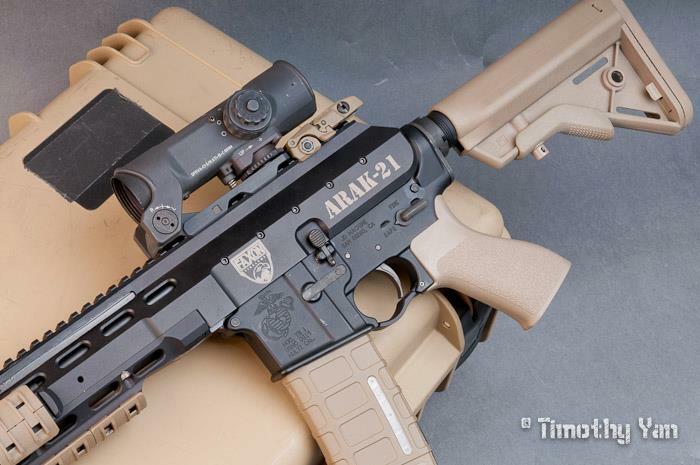 The rails also differentiate between the ARAK and other long-stroke 5.56 NATO rifles that use AR parts like the Daewoo K2, which has a floating bolt carrier group like the AR does. It also has a reversible non-reciprocating charging handle. 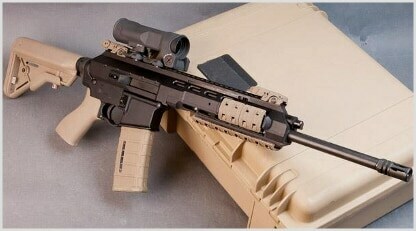 The ARAK’s recoil system is fully-contained by the upper, and does not need to use a buffer system. This means that the ARAK can be used with folding stocks as well as standard AR stocks. 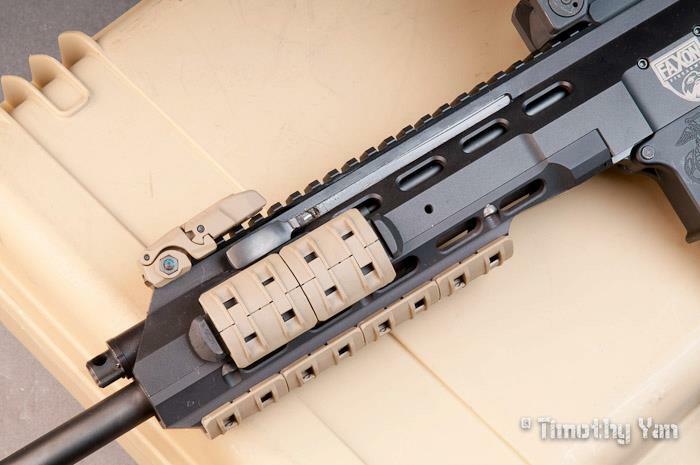 The recoil assembly dictates a slightly taller flattop rail, so for the best sight picture options you’d probably best stick with iron sights and optic mounts for SIG and H&K rifles. The ARAK has a few other tricks up its sleeves that really go the extra mile, specifically its quick-change barrel system. The ARAK’s barrel can be changed just by unscrewing six bolts and disassembling the railed handguard which clamps the barrel trunnion into place inside the upper receiver. Anyone can change the barrel with just a hex key. Faxon Firearms plans to launch their upper with your choice of 5.56 NATO barrels for $1,000, or 300 AAC Blackout barrels for $1,100, or both for $1,300. Down the road Faxon has plans for a left-handed upper as the founder, Robert Faxon, is a southpaw. We also hope that they develop barrels in different lengths and calibers down the road as well, because this upper is naturally suited to pistol ARs and SBRs, particularly in 300 BLK. Longer barrels for 5.56 would also be nice for the long-range shooter. And how can you not want an ARAK in 7.62x39mm? The ARAK is absolutely different from just about every other upper on the market save for just a small handful, and it’s got us really excited. Definitely going to look into this at SHOT Show.